Custom window treatments are about more than covering blank spaces. They're about making your sense of style a priority and illuminating your home in entirely new ways. 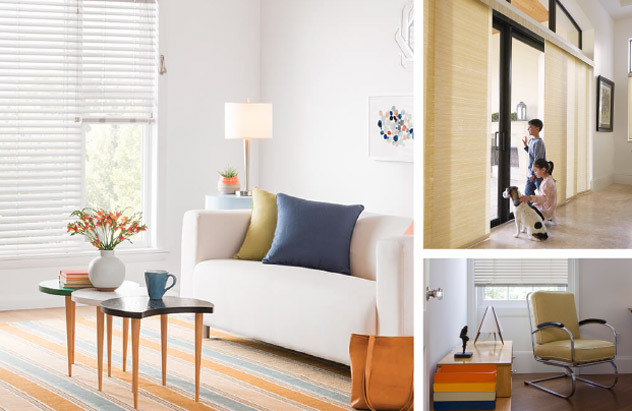 Pleated Shades add depth and structure to your window treatments with crisp pleats. Customize these shades using our wide range of textiles and light-filtering options. Shop our collection of Custom Vertical Cellular Shades. This vertical application is ideally suited for patio doors as the shade will stack tightly to one side. The cellular fabric offers energy efficiencies while complimenting your cellular shades on adjacent windows. Exterior Shades are designed with the outdoors in mind, these shades can be customized for style and function. They will keep outdoor living spaces comfortable and protected from the sun. Layered Shades give your home a sophisticated style with lightweight fabric vanes that louver between sheer fabric, while protecting your furniture from harmful UV rays. The Bali brand is an industry leader for over 75 years. For us, reliability and service are part of a proud, long-standing tradition. It's about what works for you. From high quality material to hundreds of colors to thoughtful options, we have something for everyone—and then some. When you choose Bali® custom window treatments, you get products you can feel confident in, that will exceed your expectations.